Spring uncoils most delectably in Switzerland, where snowfields melt into pastures while vivid flowers and skittish butterflies fill the meadows. We had spent a delightful afternoon exploring Basel’s medieval Old Town, ambling along cobbled streets with picturesque façades before enjoying a warming café mélange in the shadow of the Rathaus – a beautifully renovated Renaissance palace that rises up like a cardinal amongst curates from neighbouring late-Gothic and Baroque guildhalls. Basel is the southernmost navigable limit of the Rhine and its strategic position at the confluence of France, Germany and Switzerland has been instrumental as a commercial, intellectual and cultural crossroads since Celtic times. Rivers were the lifeblood of past civilisations and as I discovered, my voyage along the meandering, yet impetuous Rhine encapsulated the essence of discovery. Viking River Cruises took this oft-perceived staid holiday of choice by storm two years ago when it introduced a fleet of avant-garde Longships. This new generation of river vessels accommodate 190-passengers and boast a new design that includes more full-size staterooms with matching verandas than any other river ship in Europe thanks to a layout that includes offset main corridors. The vessels also have an innovative Aquavit all-weather indoor/outdoor terrace at their bow. Our exploration of the 443-ft long Viking Forseti concluded on the Sun Deck and we sat beside the neatly-arranged organic herb garden watching passers by waving us farewell. In no time at all the mountains of the Jura give way to the woodland tableau of Baden-Württemberg. That night we kept our curtains open as an almost full moon illuminated the cascading waterfalls that bisect rugged granite and sandstone valleys of the Black Forest. During breakfast the following morning we docked in the ancient city of Breisach which clings to a basalt rock outcrop. In the historic heart, surrounded by immense ramparts, I felt humbled stepping inside the late-Gothic St Stephansmünster, built between the 12th and 13th centuries. That evening we spruced up for the Captain’s Welcome Dinner and joined a convivial table consisting of couples from Texas and Cumbria, as well as a charming lady of indeterminate years from California. I savoured a tartar of fresh forest mushrooms with turkey risotto roll, followed by Boletus ravioli with parmesan sauce. The highlight was roasted medallions of venison with a medley of greens and potato croquettes served with juniper berry and chestnut sauce. I even found a space for cinnamon ice cream with red wine plums. Lingering over a crisp 2011 Grauer Burgunder Weinheimer Sybillenstein we decided to give a lecture on the European Union a miss. Later we joined other passengers for a digestif in the lounge where the onboard musician played familiar melodies in the background. Founded on the site of the Roman fort of Argentoratum, Strasbourg is the capital of Alsace and the largest river port on the Upper Rhine. From our mooring in Kehl we joined a tour that explored captivating Grande Île – the ancient heart of the city – before strolling around the elegant Place Kléber and Place Gutenberg, which commemorates Johannes Gutenberg, the 15th century inventor of the printing press. By the time we reached the atmospheric milieu of half-timbered houses and labyrinth of weinstubes and cafés that is Vieille Ville it was well after midday and at the atmospheric Au Pont St Martin restaurant we savoured a Fricassée aux Champignons for €11 washed down with a half-carafe of crisp Riesling Blanc at €12. Visible throughout the city is the magnificent filigree spire of the venerable pink sandstone Cathedral of Notre Dame. Unchanged since the Middle Ages, this architectural masterpiece was built between 1176 and 1439 and its exterior showcases Gothic patterns of a lacelike delicacy. There was a hushed reverence amongst us as we admired the magnificent stained glass windows casting shafts of light on to fluted columns that soar to impossibly lofty vaulted ceilings. In stark contrast, the jutting ellipse of the Louise Weiss Building in the modern Quartier Européen reminded us this city is the seat of the European Parliament. The next day we boarded coaches in Mannheim for our tour of Heidelberg. Founded in 1196, nearly two centuries before its renowned university, no German town has received more loving tributes from poets and writers than Heidelberg. A relaxed morning was spent exploring the majestic ruined façades of the red sandstone castle, setting for Sigmund Romberg’s operetta The Student Prince. Later it was time to wander through the Altstadt. From Bismarckplatz we strolled past Baroque architectural gems in the Haupstrasse before quaffing a glass of Heidelberger Dormenacker Riesling in a café in the Marksplatz, accompanied by faint organ music emanating from a recital in the venerable Heiliggeistkirche. After a lazy sojourn back on board we sat on deck as the late afternoon sun raked across villages silhouetted on the hilltops against a rose-coloured sky. It was the perfect vantage point to watch our arrival at Rüdesheim – a bucolic riverfront town in the small wine-producing region known as Rhinegau. That night we signed up for an optional dinner of regional specialities at the Rüdesheimer Schloss Hotel in Drosselgasse, a beguiling cobbled alleyway filled with captivating, ivy-clad weinstubes. A frisson of excitement pervaded breakfast as we approached the Middle Rhine. 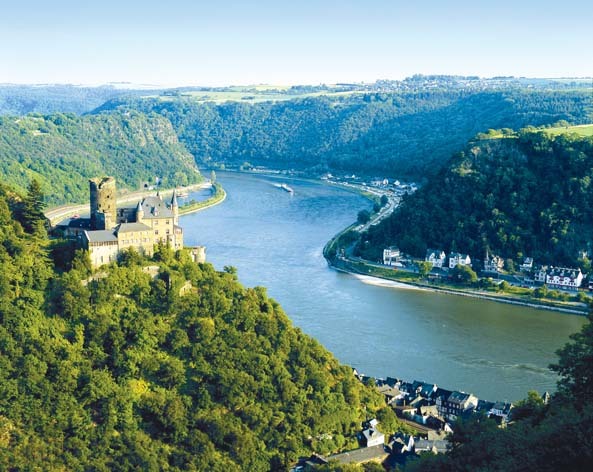 The stout hills of the Rhine Gorge enhance the grandeur of this majestic river that doesn’t just complement landscapes, it makes them. Secreted amongst this evocative tableau and overflowing in nascent splendour is the greatest concentration of storybook castles in the world. Little wonder Goethe’s journey down the Rhine in 1774 was the start of the Age of Romanticism. A procession of castles each one perched on an aerie drift past like a medieval beauty pageant that’s almost impervious to florid prose. The Mäuseturm toll tower, on a tiny island in the Hole of Bingen, protected the territory of the archbishopric of Mainz from the 13th century was closely followed by the ruins of Ehrenfels Castle. The stygian Rheinstein Castle that appears to merge with a huge, jagged slab of rock high on the hillside, nudges close to the neo-Gothic Reichenstein Castle before the feudal bastion of Heimburg Castle comes into view. Legend has it that below the precipitous Lorelei cliff the temptress’s siren song lured sailors to their deaths on rocks and rapids. Our captain tossed a handful of Euros into the water to ensure safe passage. The navigation continued past the utterly romantic Burg Katz (Cat Castle) and Burg Maus (Mouse Castle) which face each other across a steep valley. Shortly before lunch we disembarked at Braubach for a visit to Marksburg Castle. This bastion dates back to 1150 and is the best preserved on the Rhine. In the citadel we were transported back to the Middle Ages wandering through the Romanesque Great Hall, Great Banqueting Hall, armoury, chapel tower, bed chamber, and wine cellar. In the afternoon we watched our arrival in picturesque Koblenz at the confluence of the Moselle from our verandah. The Rhineland capital was revealed from tissues of morning mist. The 515 foot high twin steeples of Cologne’s magnificent gothic cathedral soar above this city founded by the Romans in 50 AD. Known simply as the ‘Dom’, construction started in 1248 and was only completed 642 years later. Located in the Altstadt close to the Rhine, we spent an enthralling morning studying the dazzling stained glass and visiting the golden reliquary which contains the remains of the Three Magi. During the night we navigated the bustling, 45-mile long Amsterdam-Rhine Canal before arriving in Kinderdijk. Lined up in two opposing rows, the 19 pristinely preserved windmills were erected in the 1600s to drain the flood-prone Alblasserwaard polders. Back on board we lunched in the cosy Aquavit terrace before sampling handcrafted Dutch cheeses. All around us, meadows winnowed with wild flowers interspersed with canals hazily reflecting the tall poplars lining their banks offered an evocative scene. Our cruise concluded at Amsterdam and it was with sadness that we bade farewell to the obliging crew of Viking Forseti. Fairy-tale castles, vineyard-clad slopes, medieval towns and pastoral villages are perhaps a cavalcade of clichés, but any cruise along the mercurial Rhine is without doubt a journey full of serendipity.